Esophageal atresia refers to a congenitally interrupted esophagus. One or more fistulae may be present between the malformed esophagus and the trachea. The lack of esophageal patency prevents swallowing. In addition to preventing normal feeding, this problem may cause infants to aspirate and literally drown in their own saliva, which quickly overflows the upper pouch of the obstructed esophagus. If a tracheoesophageal fistula (TEF) is present, fluid (either saliva from above or gastric secretions from below) may flow directly into the tracheobronchial tree. The condition was first described anecdotally in the 17th century. In 1670, Durston described the first case of esophageal atresia in one conjoined twin. In 1696, Gibson provided the first description of esophageal atresia with a distal TEF. In 1862, Hirschsprung (a famous pediatrician from Copenhagen) described 14 cases of esophageal atresia. In 1898, Hoffman attempted primary repair of the defect but was not successful and resorted to the placement of a gastrostomy. At the start of the 20th century, surgeons were theorizing about how the lesion could be repaired. In 1939 and 1940, Ladd of Boston and Lever of Minnesota first achieved surgical success in stages; success meant that the affected children survived and skin-lined pharyngogastric conduits were eventually constructed. In 1941, Haight of Michigan successfully repaired esophageal atresia in a 12-day-old baby using a primary single-stage left-side extrapleural approach. Subsequent to that child's survival and with advances in surgical and anesthetic techniques, esophageal atresia is now regarded as an eminently correctable congenital lesion. For patient education resources, see the Esophagus, Stomach, and Intestine Center and Procedures Center, as well as Choking and Bronchoscopy. 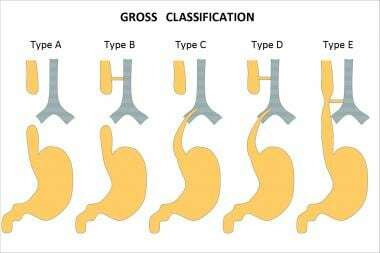 Esophageal atresia classification according to Gross. A fetus with esophageal atresia cannot effectively swallow amniotic fluid, especially when TEF is absent. In a fetus with esophageal atresia and a distal TEF, some amniotic fluid presumably flows through the trachea and down the fistula to the gut. Polyhydramnios may be the result of this change in the recycling of amniotic fluid through the fetus. Polyhydramnios, in turn, may lead to premature labor. The fetus also appears to derive some nutritional benefit from the ingestion of amniotic fluid; thus, fetuses with esophageal atresia may be small for their gestational age. The neonate with esophageal atresia cannot swallow and drools copious amounts of saliva. Aspiration of saliva or milk, if the baby is allowed to suckle, can lead to an aspiration pneumonitis. In a baby with esophageal atresia and a distal TEF, the lungs may be exposed to gastric secretions. Also, air from the trachea can pass down the distal fistula when the baby cries, strains, or receives ventilation. This condition can lead to an acute gastric perforation, which is often lethal. Prerepair esophageal manometric studies have revealed that the distal esophagus in esophageal atresia is essentially dysmotile, with poor or absent propagating peristaltic waves. This condition results in variable degrees of dysphagia after the repair and contributes to gastroesophageal reflux (GER). The trachea is also affected by the disordered embryogenesis in esophageal atresia. The membranous part of the trachea, the pars membranacea, is often wide and imparts a cross-sectional D shape to the trachea, as opposed to the usual C shape. These changes cause secondary anteroposterior structural weakening of the trachea, or tracheomalacia. This weakening can result in a sonorous cough as the intrathoracic trachea resonates and partially collapses with forceful expiration. Secretions can be difficult to clear and may lead to frequent pneumonias. Also, the trachea can partially collapse during feeding, after repair, or with episodes of GER; this partial collapse can lead to ineffective respiration; hypoxia; and, somewhat inexplicably, apnea. No human teratogens that cause esophageal atresia are known. Esophageal atresia that occurs in families has been reported. A 2% risk of recurrence is present when a sibling is affected. The occasional association of esophageal atresia with trisomies 21, 13, and 18 further suggests genetic causation. Also, twinning occurs about six times more frequently in patients with esophageal atresia than in those without the condition. Currently, most authorities believe that the development of esophageal atresia has a nongenetic basis. Debate about the embryopathologic process of this condition continues, and little about it is known. The old His theory that lateral infoldings divide the foregut into the esophagus and trachea is attractively simple, but findings from human embryology studies do not support this theory. In 1984, O'Rahilly proposed that a fixed cephalad point of tracheoesophageal separation is present, with the tracheobronchial and esophageal elements elongating in a caudal direction from this point. This theory does not easily account for esophageal atresia but explains TEF as a deficiency or breakdown of esophageal mucosa, which occurs as the linear growth of the organ exceeds the cellular division of the esophageal epithelium. In a 1987 report, Kluth eschewed the concept that tracheoesophageal septation has a key role in the development of esophageal atresia. Instead, he based the embryopathologic process on the faulty development of the early, but already differentiated, trachea and esophagus, in which a dorsal fold comes to lie too far ventrally; thus, the early tracheoesophagus remains undivided. He also suggested that esophageal vascular events, ischemic events, or both may be causes in cases of esophageal atresia without fistula. In 2003, Spilde et al reported esophageal atresia-TEF formations in the embryos of rat models of doxorubicin-induced teratogenesis. Specific absences of certain fibroblast growth factor (FGF) elements have been reported, specifically FGF1 and the IIIb splice variant of the FGF2R receptor. These specific FGF-signaling absences are postulated to allow the nonbranching development of the fistulous tract from the foregut, which then establishes continuity with the developing stomach. In 2001, Orford et al postulated that the ectopic, ventrally displaced location of the notochord in an embryo at 21 days' gestation can lead to a disruption of the gene locus, sonic hedgehog-signaled apoptosis in the developing foregut, and variants of esophageal atresia. This situation may be due to various early gestation teratogenic influences such as twinning, toxin exposure, or possible abortion. More studies are required. The incidence of esophageal atresia is 1 case in 3000-4500 births. This frequency may be decreasing for unknown reasons. Internationally, the highest incidence of this disorder is reported in Finland, where it is 1 case in 2500 births. Statistics regarding mortality in esophageal atresia are constantly changing and improving. [11, 12, 13, 14] One must consider the classification system used in reporting such statistics. Fetuses with prenatal diagnoses of esophageal atresia seem to have a worse prognosis. The cohort of babies in whom esophageal atresia is detected prenatally has a 75% mortality, whereas the cohort of babies in whom esophageal atresia is not detected prenatally has a 21% mortality. Babies who survive have varied morbidities related to any of the associated anomalies and complications. However, most children who undergo a successful repair of esophageal atresia are relatively healthy. Gross RE. The Surgery of Infancy and Childhood. Philadelphia: WB Saunders; 1953. 76. Beasley SW, Hutson JM, Auldist AW. Essential Paediatric Surgery. Oxford, England: Oxford University Press; 1996. Kumar V, Abbas AK, Aster JC, eds. Robbins and Cotran Pathologic Basis of Disease. 9th ed. Philadelphia: Elsevier Saunders; 2015. Moore KL, Persaud TVN, Torchia MG. The Developing Human: Clinically Oriented Embryology. 10th ed. Philadelphia: Elsevier; 2016. O'Rahilly R, Muller F. Chevalier Jackson lecture. Respiratory and alimentary relations in staged human embryos. New embryological data and congenital anomalies. Ann Otol Rhinol Laryngol. 1984 Sep-Oct. 93(5 Pt 1):421-9. [Medline]. Kluth D, Steding G, Seidl W. The embryology of foregut malformations. J Pediatr Surg. 1987 May. 22(5):389-93. [Medline]. Spilde TL, Bhatia AM, Marosky JK, et al. Fibroblast growth factor signaling in the developing tracheoesophageal fistula. J Pediatr Surg. 2003 Mar. 38(3):474-7. [Medline]. Crisera CA, Maldonado TS, Longaker MT, Gittes GK. Defective fibroblast growth factor signaling allows for nonbranching growth of the respiratory-derived fistula tract in esophageal atresia with tracheoesophageal fistula. J Pediatr Surg. 2000 Oct. 35(10):1421-5. [Medline]. Orford J, Manglick P, Cass DT, Tam PP. Mechanisms for the development of esophageal atresia. J Pediatr Surg. 2001 Jul. 36(7):985-94. [Medline]. Ashcraft KW, Holder TM. Pediatric Esophageal Surgery. Orlando, FL: Grune and Stratton; 1996. Clark DC. Esophageal atresia and tracheoesophageal fistula. Am Fam Physician. 1999 Feb 15. 59(4):910-6, 919-20. [Medline]. Encinas JL, Luis AL, Avila LF, Martinez L, et al. Impact of preoperative diagnosis of congenital heart disease on the treatment of esophageal atresia. Pediatr Surg Int. 2006 Feb. 22(2):150-3. [Medline]. Jolley SG. A longitudinal study of children treated with the most common form of esophageal atresia and tracheoesophageal fistula. J Pediatr Surg. 2007 Sep. 42(9):1632-3; author reply 1633. [Medline]. Lopes MF, Botelho MF. Midterm follow-up of esophageal anastomosis for esophageal atresia repair: long-gap versus non-long-gap. Dis Esophagus. 2007. 20(5):428-35. [Medline]. Poenaru D, Laberge JM, Neilson IR, Guttman FM. A new prognostic classification for esophageal atresia. Surgery. 1993 Apr. 113(4):426-32. [Medline]. Spitz L, Kiely EM, Morecroft JA, Drake DP. Oesophageal atresia: at-risk groups for the 1990s. J Pediatr Surg. 1994 Jun. 29(6):723-5. [Medline]. Engum SA, Grosfeld JL, West KW, et al. Analysis of morbidity and mortality in 227 cases of esophageal atresia and/or tracheoesophageal fistula over two decades. Arch Surg. 1995 May. 130(5):502-8; discussion 508-9. [Medline]. Stringer MD, McKenna KM, Goldstein RB, et al. Prenatal diagnosis of esophageal atresia. J Pediatr Surg. 1995 Sep. 30(9):1258-63. [Medline]. Greenfield LJ, Mulholland M, Oldham KT. Surgery: Scientific Principles and Practice. 2nd ed. Philadelphia: Lippincott-Raven; 1997. 2011-6. Shaw-Smith C. Oesophageal atresia, tracheo-oesophageal fistula, and the VACTERL association: review of genetics and epidemiology. J Med Genet. 2006 Jul. 43(7):545-54. [Medline]. [Full Text]. Diaz LK, Akpek EA, Dinavahi R, Andropoulos DB. Tracheoesophageal fistula and associated congenital heart disease: implications for anesthetic management and survival. Paediatr Anaesth. 2005 Oct. 15(10):862-9. [Medline]. FDA authorizes use of new device to treat esophageal birth defect in babies. US Food and Drug Administration. May 12, 2017. Available at https://www.fda.gov/NewsEvents/Newsroom/PressAnnouncements/ucm558241.htm. van der Zee DC, Vieirra-Travassos D, Kramer WL, Tytgat SH. Thoracoscopic elongation of the esophagus in long gap esophageal atresia. J Pediatr Surg. 2007 Oct. 42(10):1785-8. [Medline]. Spitz L. Esophageal atresia: past, present, and future. J Pediatr Surg. 1996 Jan. 31(1):19-25. [Medline]. Saxena AK, Ainoedhofer H, Höllwarth ME. Culture of ovine esophageal epithelial cells and in vitro esophagus tissue engineering. Tissue Eng Part C Methods. 2010 Feb. 16(1):109-14. [Medline]. Saxena AK. Tissue engineering and regenerative medicine research perspectives for pediatric surgery. Pediatr Surg Int. 2010 Jun. 26(6):557-73. [Medline]. Saxena AK. Congenital anomalies of soft tissues: birth defects depending on tissue engineering solutions and present advances in regenerative medicine. Tissue Eng Part B Rev. 2010 Oct. 16(5):455-66. [Medline]. Saxena AK, Ainoedhofer H, Höllwarth ME. Esophagus tissue engineering: in vitro generation of esophageal epithelial cell sheets and viability on scaffold. J Pediatr Surg. 2009 May. 44(5):896-901. [Medline]. Saxena AK, Baumgart H, Komann C, Ainoedhofer H, Soltysiak P, Kofler K, et al. Esophagus tissue engineering: in situ generation of rudimentary tubular vascularized esophageal conduit using the ovine model. J Pediatr Surg. 2010 May. 45(5):859-64. [Medline]. Dunn JC, Fonkalsrud EW, Atkinson JB. Simplifying the Waterston's stratification of infants with tracheoesophageal fistula. Am Surg. 1999 Oct. 65(10):908-10. [Medline]. Randolph JG, Newman KD, Anderson KD. Current results in repair of esophageal atresia with tracheoesophageal fistula using physiologic status as a guide to therapy. Ann Surg. 1989 May. 209(5):526-30; discussion 530-1. [Medline]. Konkin DE, O'hali WA, Webber EM, Blair GK. Outcomes in esophageal atresia and tracheoesophageal fistula. J Pediatr Surg. 2003 Dec. 38(12):1726-9. [Medline]. Way LW, ed. Current Surgical Diagnosis and Treatment. 10th ed. New York: Appleton & Lange; 1994. McCollum MO, Rangel SJ, Blair GK, et al. Primary reversed gastric tube reconstruction in long gap esophageal atresia. J Pediatr Surg. 2003 Jun. 38(6):957-62. [Medline]. Skarsgard ED. Dynamic esophageal lengthening for long gap esophageal atresia: experience with two cases. J Pediatr Surg. 2004 Nov. 39(11):1712-4. [Medline]. Foker JE, Linden BC, Boyle EM, Marquardt C. Development of a true primary repair for the full spectrum of esophageal atresia. Ann Surg. 1997 Oct. 226(4):533-41; discussion 541-3. [Medline]. Foker JE, Kendall TC, Catton K, Khan KM. A flexible approach to achieve a true primary repair for all infants with esophagealatresia. Semin Pediatr Surg. 2005 Feb. 14(1):8-15. [Medline]. Allal H, Kalfa N, Lopez M, et al. Benefits of the thoracoscopic approach for short- or long-gap esophageal atresia. J Laparoendosc Adv Surg Tech A. 2005 Dec. 15(6):673-7. [Medline]. Bax KM, van Der Zee DC. Feasibility of thoracoscopic repair of esophageal atresia with distal fistula. J Pediatr Surg. 2002 Feb. 37(2):192-6. [Medline]. Holcomb GW 3rd, Rothenberg SS, Bax KM, et al. Thoracoscopic repair of esophageal atresia and tracheoesophageal fistula: a multi-institutional analysis. Ann Surg. 2005 Sep. 242(3):422-8; discussion 428-30. [Medline]. Rothenberg SS. Thoracoscopic repair of tracheoesophageal fistula in newborns. J Pediatr Surg. 2002 Jun. 37(6):869-72. [Medline]. Chittmittrapap S, Spitz L, Kiely EM, Brereton RJ. Anastomotic leakage following surgery for esophageal atresia. J Pediatr Surg. 1992 Jan. 27(1):29-32. [Medline]. Mathur S, Vasudevan SA, Patterson DM, Hassan SF, Kim ES. Novel use of glycopyrrolate (Robinul) in the treatment of anastomotic leak after repair of esophageal atresia and tracheoesophageal fistula. J Pediatr Surg. 2011 Mar. 46 (3):e29-32. [Medline]. Lakoma A, Fallon SC, Mathur S, Kim ES. Use of Mitomycin C for Refractory Esophageal Stricture following Tracheoesophageal Fistula Repair. European J Pediatr Surg Rep. 2013 Jun. 1 (1):24-6. [Medline]. Pederiva F, Burgos E, Francica I, Zuccarello B, Martinez L, Tovar JA. Intrinsic esophageal innervation in esophageal atresia without fistula. Pediatr Surg Int. 2008 Jan. 24(1):95-100. [Medline]. Blair GK, Cohen R, Filler RM. Treatment of tracheomalacia: eight years' experience. J Pediatr Surg. 1986 Sep. 21(9):781-5. [Medline]. Deurloo JA, Ekkelkamp S, Taminiau JA, et al. Esophagitis and Barrett esophagus after correction of esophageal atresia. J Pediatr Surg. 2005 Aug. 40(8):1227-31. [Medline]. Deurloo JA, Ekkelkamp S, Hartman EE, et al. Quality of life in adult survivors of correction of esophageal atresia. Arch Surg. 2005 Oct. 140(10):976-80. [Medline]. Thoracoscopic repair of esophageal atresia with tracheoesophageal fistula. Procedure performed by Keith Kuenzler, MD, ColumbiaDoctors, New York, NY. Video courtesy of ColumbiaDoctors (https://www.columbiadoctors.org/). This chest radiograph reveals esophageal atresia and distal tracheoesophageal fistula. Note Replogle tube in upper pouch and GI air below diaphragm. This chest radiograph reveals esophageal atresia without tracheoesophageal fistula. Note absence of gas below diaphragm. This radiograph reveals radius without radial ray deformity. Contrast material has been administered, and probe has been placed through gastrostomy in this child with pure esophageal atresia. Air-filled upper pouch can be observed superiorly, with Replogle tube within it. This gapogram reveals very wide gap (>5 vertebral bodies), which requires esophageal replacement. This study is dynamic investigation, one in which surgeon and radiologist should be present to view real-time fluoroscopic images. This postoperative contrast-enhanced radiograph reveals esophageal gastric tube replacement. Anastomosis to upper pouch is in chest. Linear staple line of tube can be observed. This esophagogram was obtained using water-soluble contrast material 6 days after standard repair was performed. Chest tube is still in place. No leak is present. Waist observed here at site of recently performed anastomosis is usual and does not, at this stage, necessarily indicate stricture. Child went home and was eating well 3 days later.